Are there too few jobs for everyone? Has automation destroyed America's manufacturing industry? Or is it that our workers haven't learned the skills necessary to do the new jobs we are creating? Those are, roughly, the core positions on either side of the skills-gap debate. Does it or doesn't it exist? Paul Krugman has called the skills gap a "zombie idea," and the New York Times editorial board wrote that it was "mostly a corporate fiction, based in part on self-interest and a misreading of government data." On the other side, economist Thomas Piketty has said that, to reduce inequality, we must focus not on progressive taxation but on "really investing in skills, investing in schools." But instead of arguing over whether or not we are reading the data correctly, let's set it aside for a moment. Perhaps those who say the skills gap does not exist are focusing primarily on the input of C-suite executives, and considering only opportunities for white-collar, middle-class workers; they may have immersed themselves so deeply in quarterly Labor Department reports that they are divorced from any on-the-ground realities. Let's focus our attention, instead, on those who could benefit most immediately from some simple changes to our education system. We need to put a face — or faces — on the problem. And we can start with Jose Rosado, a metal fabricator in Cleveland; and Jennifer Neustedt, a health caregiver who works with the elderly. The pair are both successful in — and committed to — their fields of work, but they do not earn much more than minimum wage. With a little more training, with a few more skills — a vocational tech program for Rosado to obtain certification in welding, a two-year community college nursing program for Neustedt — both could earn significantly more. But they are unable to pass the GED, the high school equivalency test that was revamped in 2014. This modified GED — full of difficult and unnecessary changes, according to several counselors who have been teaching the test for decades — is, ironically, responsible for holding back hundreds of thousands of education-starved individuals. That's a real skills gap, not a theoretical one. In this, our Future of Work issue, we tell the stories of Rosado and Neustedt and others like them in "Making the Case for a Good-Enough Diploma." Elsewhere, we go behind the scenes of another big problem in American education: the predatory practices, and dismal success rates, of for-profit colleges ("Confessions of a For-Profit College Inspector"). Only by bringing attention to these issues can we hope for reform. But we shouldn't just sit and wait; let's take our cue from Samasource, a start-up creating its own classes outside of the traditional education system to teach digital literacy skills to the rural poor in an attempt to lift them out of poverty ("The Pilot Program"). It is Samasource's promising grads and their very modern skill sets that will fill the jobs of tomorrow. Press Release: Pacific Standard Asks, What Is the Future of Work? Santa Barbara, CA — Should you be worried or excited about the future of work and workers? With support from The Rockefeller Foundation, The Center for Advanced Study in the Behavioral Sciences at Stanford University asked this of business and union leaders, social scientists, technology visionaries, activists, and journalists around the world. 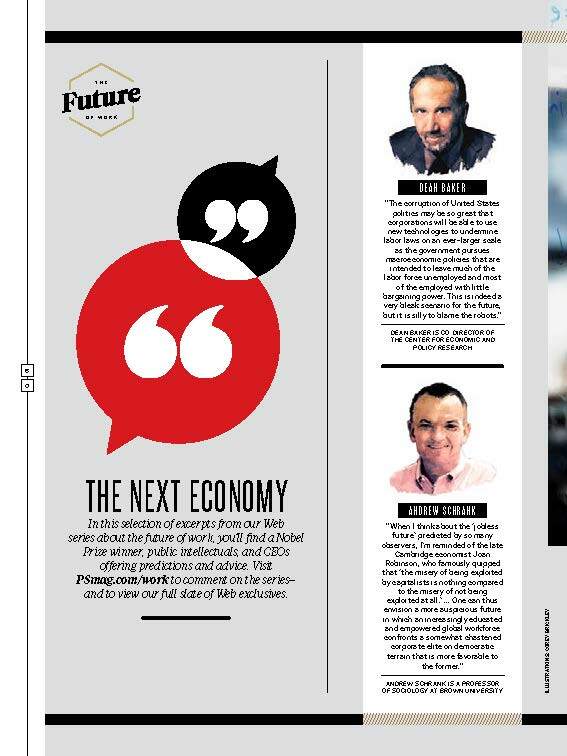 The project, in collaboration with Pacific Standard, is called "The Future of Work and Workers." Beginning on Monday, August 3rd, and continuing for at least three full months, contributors will post daily op-eds at PSmag.com/work, where readers will be invited to participate in the conversation. A commenting system will allow Pacific Standard visitors to directly engage with both Pacific Standard editors and writers and the dozens of contributors who have signed on specifically for this project. Original articles will also appear in the November/December 2015 print and digital issue of Pacific Standard, available on newsstands November 3rd. "The rapidly evolving future of work raises profound questions for our economy and our culture," said Nicholas Jackson, interim editor-in-chief of Pacific Standard. "We're thrilled to partner with CASBS for an unprecedented forum, gaining insights from some of the deepest thinkers and hands-on experts." 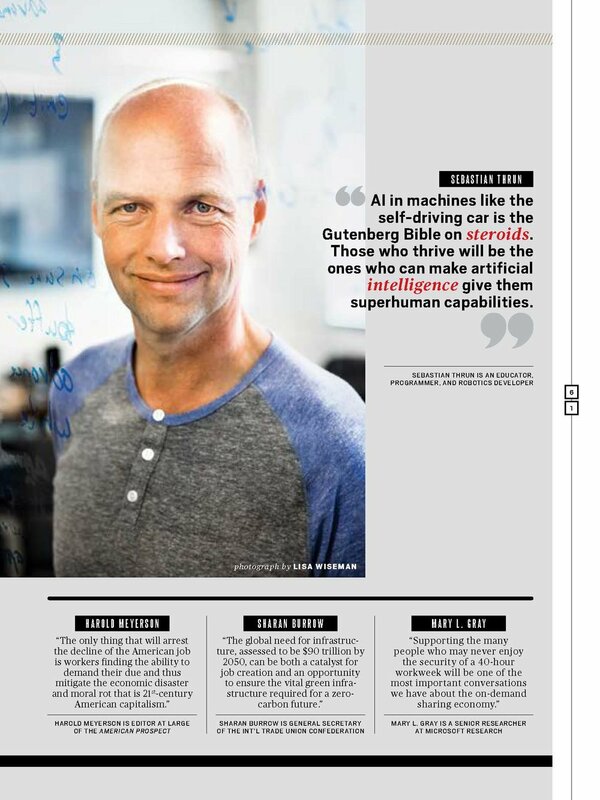 Udacity CEO Sebastian Thrun on how, because machines can learn faster than people, it's just a matter of time before we'll be outranked. President of the AFl-CIO Richard Trumka on how an increasingly global economy now demands that labor law reach beyond national borders. Katherine Isbister, a professor of computational media at the University of California–Santa Cruz and former director of the Game Innovation Lab at New York University's Polytechnic School of Engineering, on making technology easier on our minds and bodies. Center for Economic and Policy Research co-founder Dean Baker on why we shouldn't fault robots for taking our jobs. Feminism Unfinished author Dorothy Cobble on how most Americans work too much and are paid too little. Additional contributors will include current president and CEO of TIAA-CREF and former vice chairman of the Federal Reserve System Roger Ferguson, economic historian and Cornell University assistant professor Louis Hyman, New York University School of Law postdoctoral fellow Karen Levy, Microsoft senior researcher Mary L. Gray, political scientist Frances Zlotnick, Washington Post labor reporter Lydia DePillis, the New York Times' John Markoff, and Harvard University's Mario L. Small. Imagine a place where great minds are brought together to confront the problems of the day, where original interdisciplinary thinking is the norm, where ideas can change our world. The Center for Advanced Study in the Behavioral Sciences (CASBS) is such a place. As technologies have become smarter, and as globalization, immigration, and other events transform social practices, behavioral science is increasingly important for predicting future developments and understanding their impact. At CASBS, we make behavioral science relevant. Pacific Standard is the award-winning magazine for the affluent and influential readers interested in working toward forward-looking changes to private behavior and public policy. By combining research that matters with ambitious narrative and investigative reporting, Pacific Standard tells stories across print and digital platforms about society's biggest problems, both established and emerging, and the people attempting to solve them. The Miller-McCune Center for Research, Media and Public Policy is a private operating foundation utilizing the latest and most promising research in the social sciences to promote civil discourse and workable solutions to current and emerging social problems. Through publications and events, the Miller-McCune Center examines the science of society with a broad community of readers, contributors, researchers, and thought leaders. We live in a time of growing anxiety about the nature and availability of jobs in the future and the consequences of current transformations for future populations. Begun in 2014, the CASBS project on the future of work and workers investigates how work is changing globally and the implications for people, business models, politics, and economies. It considers and catalyzes research and policy proposals on transformations in technology, skill requirements, social protections, and workers' voice. The initial funding from the Rockefeller Foundation led to the production of a series of nearly 100 short articles for Pacific Standard, articles that explore what a wide-ranging group of authors (from futurists to sweatshop labor organizers, from social scientists to leaders in business and education) believe are the most important issues confronting work and workers in the 21st century. Subsequently, the working group received requests from and has met with a multi-party group of German parliamentarians focused on these questions, the Danish Confederation of Enterprises, and Senator Michael Bennet of Colorado and his staff. Margaret Levi also has appeared on numerous panels and is co-chair of a conference and preliminary task force organized by the American Academy of Arts and Sciences. After the publication of these articles, however, it became apparent that many other initiatives on the future of work and workers were emerging alongside the the CASBS project. The working group met to determine if it had done its work and should disband or whether there was a niche CASBS could fill. This led to a new emphasis: No other project was as concerned as we are with the future of workers. There are many discussions of job and labor markets and educating the next generation for the world of work in which people will find themselves. Yet, no other project is as resolutely concerned with the effects on lives and communities, the forms of social and economic protection that must evolve, new means for giving employees and workers power within this new set of spaces, and the very meaning of work itself as a source of dignity and identity. Exploration of platforms designed by a combination of engineers and social scientists to achieve multiple ends. Members of the working group already have had success in creating new sorts of work teams ("flash organizations"), and others are making progress in using platforms to enhance workers' voice and power over the supply and uses of their labor. This piece has support from the Stanford Cyber Initiative funded by the Hewlett Foundation. Universal basic income experiments. Several members of the working group have been interacting with those running the two experiments in California—one funded by Y-Combinator in Oakland and the other by the Economic Security Project in Stockton—and with the Basic Income Lab at Stanford. We are raising serious issues about both the approach and the projected outcome, in particular given that the short-lived nature of the experiments means long-range promises of support cannot be given, making it impossible to assess if a basic income would actually change life choices. Reassessment of skills and how they are developed. Research into the complex skills of undervalued labor — construction, child care, etc. — reveals that the tacit knowledge embedded in work is learned and passed on through networks. Recognizing that these are skills and determining which of these kinds of skills will be useful in the future leads to a rethinking of legal regulations and other public policies governing work. Socio-economic weather maps. This is an initiative to identify what kind of data we have to assess what counts as a skill, a job, and work. We are considering how best to link data sets, fill in data gaps, and use qualitative materials to supplement the administrative and statistical data currently available. The Pew Charitable Trust is providing some initial funding. John Ahlquist, Evangelina Argueta, Ragui Assaad, Rob Atkinson, Diane E. Bailey, Dean Baker, Stephen R. Barley, Janine Berg, Michael Bernstein, Jeff Bleich, Sharan Burrow, Jennifer Chacon, Herrick Chapman & LIsabeth Cohen, Dorothy Sue Cobble, Scott Cook, Maggie Corser, Jana Costas & Gideon Kunda, Mark R. Cullen, Rosanne Currarino, Lydia DePillis, Dale Dougherty, Maria Echaveste, Peter Evans & Chris Tilly, Roger W. Ferguson Jr., Anne Focke, Martin Ford, Frances Fox Piven, Richard Freeman, Mary E. Gallagher, Mary L. Gray, Steven Greenhouse, Ryan Harper, Freeman A. Hrabowski III, Silja Hausermann, Louis Hyman, John Irons, Katherine Isbister, Natasha Iskander, Neil Jacobstein, Yi-huah Jiang, Kevin R. Johnson, Katherine R. Jolluck, Travis Kalanick, Jerry Kaplan, Amita Katragadda, Thomas A. Kochan, Mike Konczal, Jaron Lanier, Margaret Levi, Frank Levy, Karen Levy, Josh Lewis, Nichola J. Lowe, John Markoff, Ann Markusen, Harold Meyerson, Ruth Milkman, Bethany Moreton, Jacob Morgan, Nils J. Nilsson, Margaret O'Mara, Roberto Pires, Charles Postel, Alex Rosenblat, Paul Saffo, Nathan Schneider, Trebor Scholz, Juliet B. Schor, Andrew Schrank, John Seely Brown, J. Robert Shull, Greg Segura, Calvin Sims, Mario L. Small, Robert Solow, Sebastian Thrun, Julie Ticona, Richard Trumka, Moshe Y. Vardi, Judy Wajcman, D.A. Wallach, Mark R. Warner, Kent Wong, Frances Zlotnick.